Three Bars Ranch - Three Bars Guest Ranch is located in the south eastern corner of British Columbia, in an area know as the Rockies region. We are a two hour drive south of Banff National Park and three hours northwest of Waterton & Glacier National Parks. Three Bars Guest and Cattle Ranch invites you to experience the ultimate horseback riding vacation in the Canadian Rocky Mountains of British Columbia, Canada. 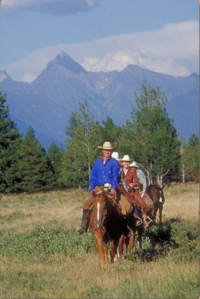 Three Bars Dude Ranch offers the most diverse activities program available. Including a complete range of horseback riding programs, hiking, river rafting, mountain bikes, fly fishing, tennis, heated pool, hot tub, and fitness facility. Enjoy your vacation experience with true western hospitality, Three Bars Ranch style. If this is your first Dude Ranch vacation, you will surely be impressed. Horseback riders, or non-riders have the trip of a lifetime. Singles, families and couples are all welcome. No previous experience, no problem we have Dude Ranchers Association certified wranglers to give you a helping hand. All of the activities at the ranch are designed to include all levels of experience. From the old hands to the green horns we will work with you to make you more comfortable. Here at Three Bars we tailor your holiday to be as active as you choose to be! 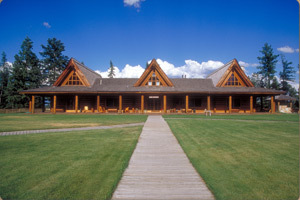 Three Bars Guest Ranch is located in Canadian Rocky Mountains of British Columbia, Canada, between Banff Park and Glacier Park. This special part of the world offers an abundance of nature, clean fast moving water, green fields and breathtaking mountain vistas. The Beckley family; Jeff, April, Tyler, Jenna and Jesse invite you to come join us in the beautiful Canadian Rocky Mountains for an adventure of a lifetime.